The National Solar Observatory in Sunspot, New Mexico that caught the attention of the world when it was shut down on September 6, 2018, citing a “security issue” by FBI agents who reportedly swooped on the facility after arriving in Blackhawk helicopters, has asked for “patience” as it continues to be locked down. Members of the FBI, the Albuquerque Journal reported, were on the scene. The lockdown has fueled theories such as proof of extraterrestrials, UFO sighting, and baseless speculation that the observatory had spotted Earth-threatening solar flares. The fact the observatory is only about 120 miles from the site of the Roswell UFO incident has only added to the speculation. In the days since, the sheriff’s department has said it has no idea what is going on. And the lockdown continues with no new information. “The FBI is refusing to tell us what’s going on. We’ve got people up there [at Sunspot] that requested us to stand by while they evacuate,” local sheriff Benny House told the Journal. “The FBI were up there. What their purpose was nobody will say.” “We have absolutely no idea what is going on,” says Alisdair Davey, a datacenterscientist at the National Solar Observatory. “As in truly nothing, which in itself is just weird.” Messages left with the FBI field office in Albuquerque were not returned. 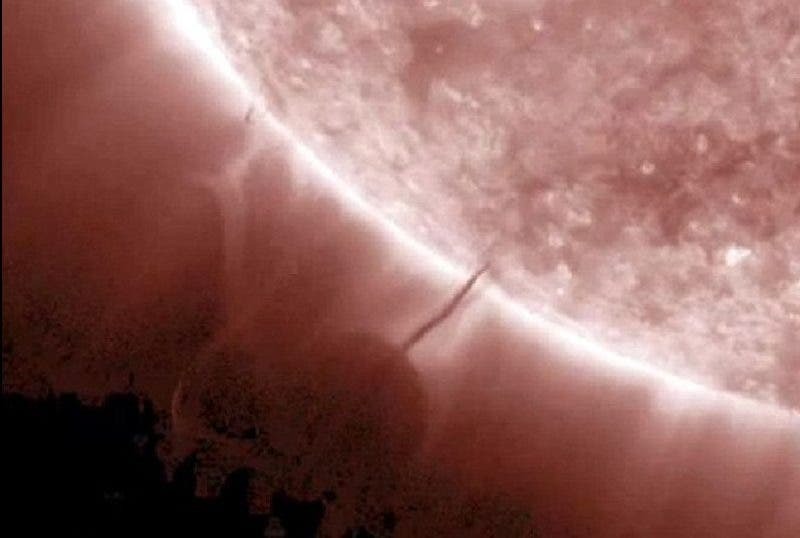 Fueling the alien conspiracy theories might be memories is a past event that occurred in March 2012, where telescope images of the sun showed what appears to be a planet-size shadowy object tethered to the sun by a dark filament. In the NASA image sequence, a burst of brightly lit material can be seen erupting from the sun’s surface surrounding the dark object, after which the orb detaches from the sun and shoots out into space. The footage, a composite of images captured by NASA’s Solar Dynamics Observatory and processed by scientists at NASA’s Goddard Space Flight Center, went viral on YouTube, where viewers are suggesting it shows a UFO spacecraft refueling by sucking up solar plasma, or at the very least, the birth of a new planet. The National Solar Observatory, which manages the facility (above), gave an update on Facebook that was shared on the observatory’s own page. “AURA – our management organization – is addressing a security issue at Sunspot Observatory at Sacramento Peak, New Mexico and has decided to temporarily vacate the facility as a precautionary measure,” the NSO said. That post was responded to with a flurry of comments from followers who asked why the NSO was continuing to keep the facts secret. Another message on the observatory’s website references the intense interest in the closure and says that administrators are working hard to open the facility again. Previous Post:Did the sphinx have a “Twin sister”?